This is a delightful Mediterranean tuna dish. 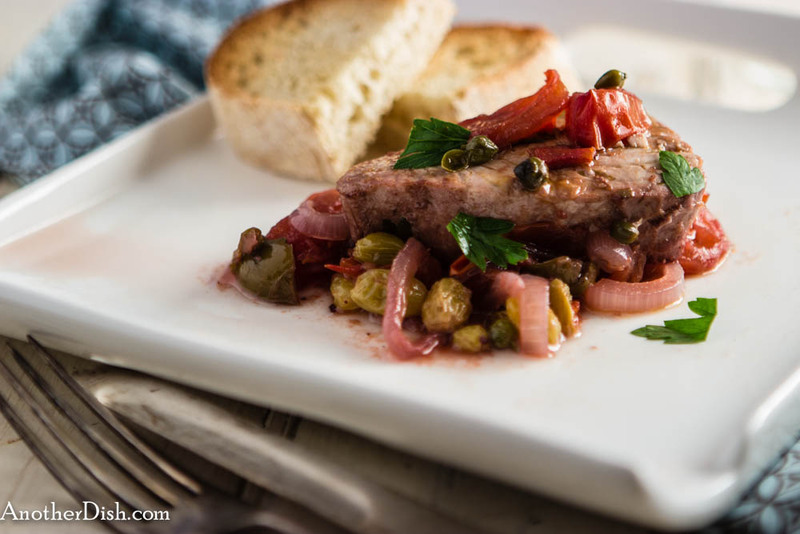 The tuna steaks are seared, then braised in a very nice red wine-caper sauce with olives, tomatoes, garlic, onions and raisins, providing for delicate, slightly sweet/slightly sour flavors. I hope you’ll try it! Combine the cold water and 2 Tbsp salt in a large bowl. Stir until salt is dissolved. Place the tuna pieces in the water, and let stand for 1/2 an hour. Rinse under cold water, and dry with paper towels. Heat olive oil in a large, shallow sauce pan over medium-high heat. Add the tuna pieces and sear on all sides. Remove from pan and let stand on a plate. Turn heat to low. Add the garlic and onions; saute for about 5 minutes, just until soft. Add 1 tsp salt, capers, olives, raisins and wine. Turn heat up to high, partially cover and cook for 4 minutes. Add the vinegar. Reduce heat to low. 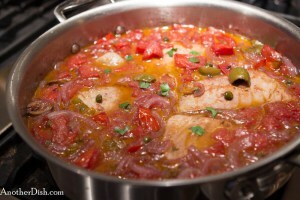 Add tuna to the sauce, partially cover and braise for 5 minutes. Remove from heat, and let stand for 1 hour. Season to taste with additional salt. Serve with toasted crusty bread slices. This entry was posted in Italian, Main Dishes, Seafood and tagged Cooking, Food, Food Photography, Foodie, Italian Food, Recipes, Seafood, Tuna on July 5, 2013 by AnotherDish.